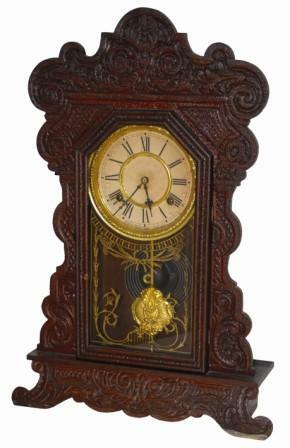 Waterbury Clock Co. walnut parlor clock, "Felix", ca 1906. The 22" high case is very dark, crusty and smoky, but complete and original. The pendulum and dial rings are bright and clean. Interesting that he only cleaned those parts. The glass, dial papers, gong, and 8 day movement, are all original. It is running and striking half hours on the gong. It is a sorry looking black dirty case, but there are two beautiful blue labels on the back, and the bright pendulum and dial rings I previously mentioned. Beats me. Ly-Waterbury No. 1655.